Last year’s Warrior Run saw The Mighty Mighty Bash, Rose Bleed, Racey and Emma The Condemner (Team Black) take on Chaka Carnage, Shambolic, Kapow, Enyo Face and Chariot Sophia (Team Blue). How many of those nine are taking part this time around, and who else is competing for the Rockers this year? For those that took part last year, is there anything you learned from the experience that has changed the way you prepared for this ‘rematch’? Are there any particular roller derby skills that will be useful on the Warrior Run? What special training have you done for the event? The Rockers have hit their initial £750 fundraising target, and are now hoping to make four figures. What sort of things will this money go towards? 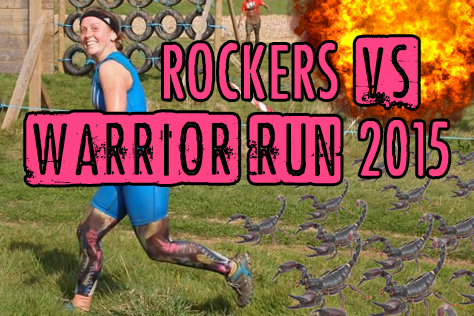 Finally, which side is going to record the best Warrior Run time out of Teams Blue and Black? This entry was tagged Brighton Rockers, fundraising, roller derby, roller skating, sport, UKRDA, Warrior Run, women's sport.